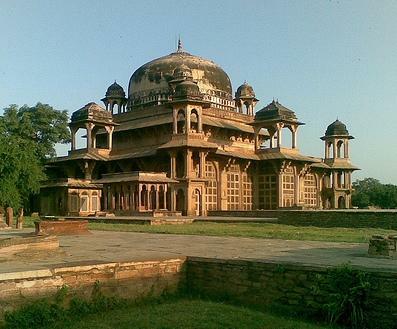 Gwalior Fort: This forms one of the prime attractions of the city. One of the unconquered forts of India, This fort is located just 2 miles from the city and can be seen from each and every point of the city. This fort has lots of additional attractions and historical monuments within its boundary which are worth visiting, which includes the Man Mandir Palace, Gujari Mahal, the Teli ka Mandir, Saas Bahu Temple and many other Hindu Temples. Additionally the Sound and Light Show of the fort is worth watching to make the trip complete. Jai Vilas Palace: Jai Vilas Palace is located right within the city and exhibits a unique architecture which is a mixed pattern of Italian, Tuscan and Corinthian Architecture. Jai Vilas Palace was built by Maharaja Jiyaji Rao Scindia and around 35 rooms within the palace are presently converted into a Museum. 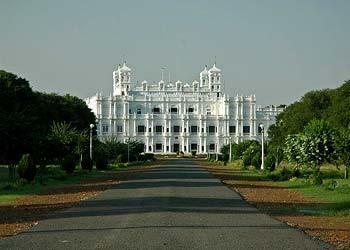 Jai Vilas Palace was designed by Lt. Col. Sir Michael and exhibits exclusive furniture from Italy and France. The Jai Vilas Palace presently houses the Present Maharaja of Gwalior. Several eye catching treasures are showcased at Jai Vilas Palace which includes a Silver Train, a Glass Cradle from Italy and many exquisite dinner wares used by Aurangzeb and Sha Jahan. Other than that there are several mementos of the past members of the Scindia Family which are exhibited in the Jai Vilas Palace Museum. 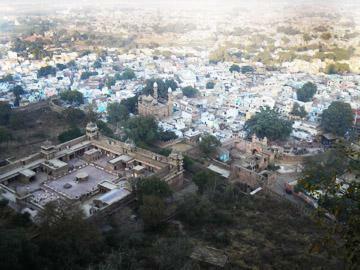 Mia Tansen's Tomb: Mia Tansen's Tomb is located around 120 km from this city. It is one of the most interesting Islamic Monuments located in this place. The tomb is very artistically constructed and a small garden is designed around the Mia Tansen's Tomb. Sun City: Sun City is one of the newly added attractions in this place. Sun City is a huge Amusement Park located on the way to LNIPE. Sun City is considered to the biggest Amusement Park of Madhya Pradesh and offers a great variety of entertainment in the form of joy rides, food hub, amusement park, hotels and various entertainment activities. Tighra Dam: Tighra Dam is an ideal picnic spot located on the outskirts of this city. Tighra Dam is a huge water reservoir which offers exceptional outing with various boating and entertainment activities. The Tighra dam was constructed in the year 1971 and since then has been popularly served as tourist attractions around the city. Dhoomeshwar Mahadeo Temple: Dhoomeshwar Mahadeo Temple is one of the most visited tourist attractions in and around this place. This temple is a prominent sacred places that is visited by many tourists all around the year, especially during Mahashivratri. Dhoomeshwar Mahadeo Temple is located on the banks of River Sindh and the architectural pattern of this temple resembles to that of the Kandariya Temple of Khajuraho. The Dhoomehswar Mahadeo Temple is exactly 3 km from the city and is a fine example of Bundelo Architecture. Pawaya: Pawaya is a finest collections of ancient ruins located around 68 km away towards the Jhansi Highway. Pawaya holds the archaeological remains which belonged to the 1st and the 8th Centuries and were excavated here. Pavaya holds a lifesize statue of Chaksha Manibhadra of the 1st AD. Pawaya remains is an excellent example of how the Nag kings in the 3rd AD lived. Orchha Wildlife Sanctuary: Orchha Wildlife Sanctuary is located just 85 km from the city and is one of the must visit places. Orchha Wildlife Sanctuary is located on the River Betwa and is a huge forest reserve which manages to appeal its visitors with its solitude and forest ambience. Orchha Wildlife Sanctuary is home to many wildlife and Birds. It is often referred as Bird Sanctuary for it houses around 200 species of birds. But most likely an adventure sport lover should definitely make a point of visiting Orchha Wildlife Sanctuary because of the adventure sport options it offers which include Trekking, Camping, River rafting, Boating, Canoeing and hiking. The National Chambal Sanctuary: River Chambal: Rive Chambal is one of the most interesting tourists' attractions in and around this place. 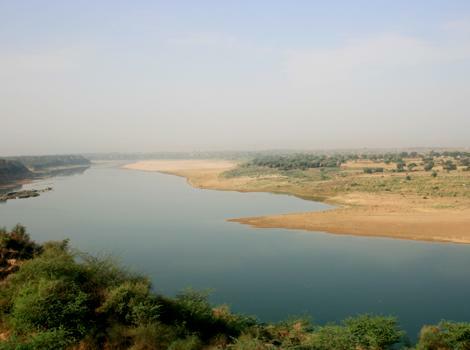 River Chambal speaks of the untamed wilderness which flows through a total length of 435 km. River Chambal also houses National Chambal Sanctuary which is a house to varied flora and aquatic life. The Aquatic Paradise, the Sanctuary is home to several aquatic animals including River dolphins, crocodile, freshwater turtles, and various other species of fishes. The National Chambal Sanctuary offers various activities which include Boat Cruising, Crocodile viewing and Dolphin Cruise. This place experiences extreme climates in all seasons. For say, summers are too hot and winters are too cold. Rainfall is heavy in the region, but is restricted only to monsoons. And hence the ideal time to visit is from October to March when the climate bit cold but is pleasant. Avoid visiting in summers due to high humidity and heat. During summers, the temperature can shoot as high as 46 degrees Celsius and thus could be uncomfortable. Especially if you plan to visit the fort during summers, that wouldn't be a good idea. It takes at least half a day to visit and in summer it's just not possible to walk on the pavements or the side path of fort in the scorching heat. So just avoid! And there is no question of visiting the fort in the evenings, because the fort closes early evenings. But winters the climate is quite pleasant and thus should be best visited in winters. The suggested clothing during winters is light woolen. One can shop for many items which form a specialty of this place. Few of such specialties include the Chanderi Saree, the artifacts and the handicraft items which showcase the local tradition and artistic talent. The best place where you can shop the original and reasonable items is the Bazaars at Bada, Laskar and Patankar. Bargaining plays a major role when it comes to buying items in these bazaars. Patankar Bazaar, Rajwara Bazaar and Bada Bazaar are known for the state run emporiums which sell best varieties of Chanderi Sarees. Mrignayani is one such official shop at Bada Bazaar where one can buy several handicraft items made in this place. In such handicraft items and artifacts, one has a wide range to select from which includes hand woven carpets, decorative items, handmade jewelry, wall hangings, various home decorative items and lacquer ware. Tribal jewelry is also set for sale in many State-run emporiums. Other than that, one can also buy leather chappals and sneakers in the markets. I'm planning to visit Gwalior next month with my family. Is April/May a good time to visit? How is the weather there during the summer? Also, can you please suggest me some budget hotels in a safe area?